Sophomore defender Anna Soles runs to kick the ball during the women’s club soccer team’s game against Cornell University on Oct. 13. The team will compete at the National Championship in Arizona Nov. 16–18. 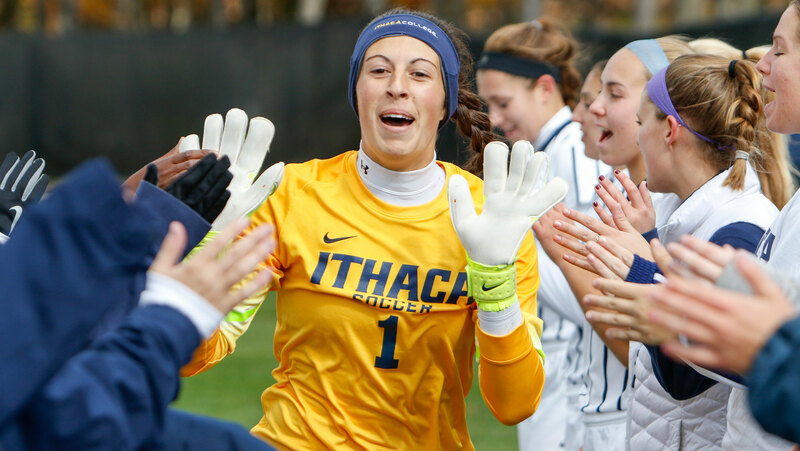 For the first time in its history, the Ithaca College women’s club soccer team has qualified for the National Intramural-Recreational Sports Association National Championships, to be held Nov. 16–18 in Phoenix, Arizona. The women finished their season atop the New York Southern Tier table with a record of 8–1–2. The Wombats edged both neighboring Cornell University and perennial power Binghamton University, taking 46 points out of a possible 50. After a strong showing in the league, the Wombats were invited to the Region 1 tournament held Oct. 28–29 at the Kirkwood Soccer Complex in New Castle, Delaware. The women advanced from the group stage after defeating club teams from the Rochester Institute of Technology, Messiah College, The College of New Jersey and the University of Maryland. The Wombats were eliminated from the tournament after falling 2–0 in the semifinal of the tournament to Northeastern. They were the only Division III team to advance past the group stage. Despite bowing out in the semifinal, the Wombats were awarded an at–large bid to the NIRSA National Championships, based on the team’s accumulated power points. Founded in 2002, the Wombats are managed by coach Andy Baker, who is currently in his 14th season with the team. Baker, director of sales at local catering company Serendipity Catering, said he has directed much of his free time and energy over the years trying to get his team to the highest level of competitive club soccer. Baker said he is focused on preparing his team for its biggest challenge yet. Under Baker, the Wombats have been consistently ranked in the top 10 of NIRSA’s Region 1 Women’s Club Soccer Rankings. On Oct. 28, the women were ranked fourth in Region 1. Senior forward Athena Manzino credits much of the team’s success this season to the man at the Wombats’ helm. Baker said the alumni have been another source of inspiration for the team. Senior Mackenzie Lozano has been a member of the Wombats since her freshman year. Lozano said she and her teammates are playing for their longtime coach. Lozano said she also credits her team’s strong on–field chemistry with its chemistry off the field. In Phoenix, the Wombats will be pitted against the very best across the country, including several Division I teams. Manzino said she has been confident in the team all year. “I said it at the beginning of the season: I could just feel it was our year,” Manzino said. The Wombats have started a GoFundMe page in an effort to alleviate the costs of their upcoming trip to Phoenix. The team has raised $9,053 of their $10,000 goal in just nine days.